As always, a variety of incremental improvements have been made to 17 drivers to ensure robust functionality, which you can review in the TOP Server Release notes. Further expanding the already long list of drivers and protocols available in TOP Server for integrating your variety of devices and information sources out there, the V6.6 release adds a new driver for EUROMAP63 connectivity. EUROMAP 63 is an open source, file-based protocol developed in conjunction with the Society of the Plastics Industry (now the Plastics Industry Association). 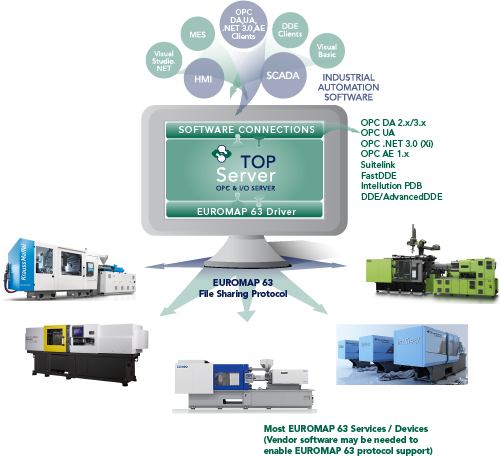 As such, EUROMAP 63 is commonly used for for third-party data access communications to Injection Molding Machines (IMMs) across a number of industries including Tier 1 and 2 automotive, pharmaceuticals, food & beverage, consumables, electronics and packaging. Some injection molding machine manufacturers retrofit their older IMM models with the ability to enable EUROMAP 63, while others provide an application or software to receive EUROMAP 63 requests, communicate with the device using its proprietary protocol and deliver EUROMAP 63 responses. In the below diagram, you can see two of the most common architectures used by IMMs for supporting EUROMAP 63 data exchanges. Due to such differing configurations, it's not uncommon to need additional software or plug-ins from the IMM manufacturer to enable EUROMAP 63 support for working with the EUROMAP 63 driver in TOP Server. The "Architecture" section (starting on Page 5) of the EUROMAP 63 Driver Help File provides reference diagrams for some of the more common IMM manufacturers mentioned earlier and how they support EUROMAP 63. And the EUROMAP 63 driver supports automatic tag generation from the device or from an offline GETID file, making it easy to get started accessing only the parameters you need from your IMMs for the greatest efficiency. And, if all of that isn't enough, the driver supports localized languages that cover Japanese, German and Chinese. For certain applications, normally involving telemetry, unreliable networks and a lot of devices, having greater control over the number of connection attempts to a device is important for ensuring the most streamlined and efficient communications. This is common in industries like oil/gas, water/wastewater and power/distribution where geographically distributed locations required the usage of radios and cell modems to enable connectivity to devices in the field. And bandwidth for such connections does not come cheap, so minimizing unnecessary traffic to these remote sites is extremely important. Having a connection to a device fail may seem relatively insignificant, but if you're attempting to retry that connection and this is happening on 100s of devices, the wasted time and bandwidth for devices that probably won't connect the second or third time adds up fast. Also, those retries over larger numbers of devices, adversely affects the polling performance of the devices where there are not any issues connecting. During critical periods, such as heavy storms, it is crucial to scan devices as soon as possible to determine critical alarms, areas of power outage, and and down devices. In such systems with thousand of devices with multiple devices having to be configured under single channels, the delays resulting from unnecessary retries could more than double the time to obtain critical data. 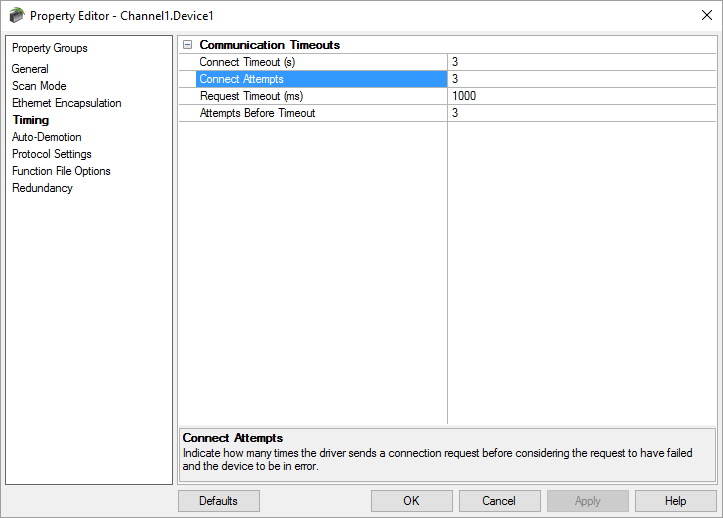 So starting with TOP Server V6.6, for certain serial drivers, there is now a configurable "Connect Attempts" setting that applies when using Ethernet Encapsulation for communications. Previously, the number of connection attempts was tied to the number to request retries. And also in TOP Server V6.6, for the Fanuc Focas Ethernet driver, we've added support for Numerical Control NC parameters to the existing support for Programmable Machine Control (PMC) parameters that enhance the user's ability to use TOP Server to monitor and report on machine productivity and efficiency. Many applications require access to the NC data, which contains more real time variables such as “feeds and speeds”. This more granular data can be used to determine quality metrics, predict failure, and for a wide variety of other purposes. By adding the cnc_rdparam tag, TOP Server can now get at all this data. On some CNC models there are as many as 100 parameters that are accessible through this new addressing scheme, with many of these parameters containing several data points. 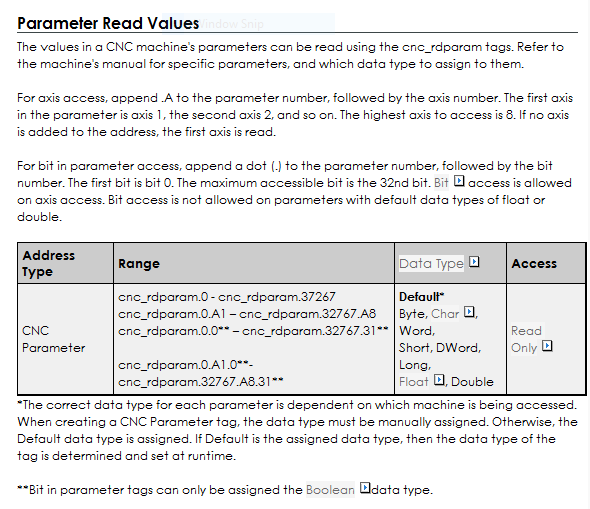 For specific parameters in your Fanuc CNC, you'll want to refer to your specific model's manual. This includes accessing individual axis information (A1 - A8, depending on how many axes your CNC supports). Bit access within parameters and for axes is also supported. 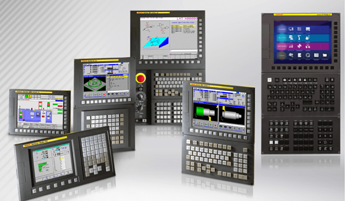 Previously inaccessible variables from your Fanuc CNCs can now be integrated into your control system for increased visibility into the operations of your CNCs. These and the other features not covered here provide increased data source integration, performance and access to information. As always, a list of the other enhancements and features in the release notes that we just don’t have room to cover here is available - click for details. Want to see TOP Server V6.6 for yourself? Download the free trial.